Geology is a really diverse field. Many of us may not work directly in the oil industry. The oil and gas guys make the biggest dollars in the field of geology and know their stuff pretty well. If you are preparing for the ASBOG exam for FG or PG, I would recommend that you review some of the basic stuff of petroleum geology such as source rock, reservoir rock, various types of traps (structural traps, stratigraphic traps, ,hydrodynamic traps etc), classification of petroleum reserve and resource and other basic concepts. Any basic petroleum geology book would have the information that you need. For example, Elements of Petroleum Geology, Second Edition or Petroleum Geoscience: From Sedimentary Environments to Rock Physics would be most helpful. If you are in the coal industry, you must know the reserve calculation method for coal. Similarly, in oil industry the most basic calculation for oil reserve is done using “recoverable STO” usually reported in cubic feet. STO stands for STOCK-TANK OIL. Sometimes, you may see STB (Stock Tank Barrels) which is equal to STO/5.615. The porosity is usually measured using lab tests by geophysical methods (neutron, density or sonic logs). Archie’s formula is used to calculate the water saturation (learn about Archie’s formula, google). If you stop for a minute and think about the formula, you would realize that it is basically a volume calculation. You start with the calculation of the Volume of the reservoir rock as VOLUME=AREA*THICKNESS. Often times, the area is reported in terms of length and width. Make sure that the units are consistent and convert all units to FEET. When you multiply the VOLUME of the reservoir by porosity (n), you get the total amount of void space in the reservoir. Porosity is reported in percentage. Such as 30% porosity. use 30/100 (or .30) in your calculation. Porosity is unit less. Next step is to calculate the oil saturation. Use formula above, So=1 – SwWhen you multiply Sw, you get the volume of the void space with oil. Sw is also unitless and reported as percentage. For example, if you have 25% water saturation, you really have 1-.25 = 0.75 ot 75% oil saturation. Only a portion of the reservoir oil can be recovered. The recovery factor is not constant and may change depending on available technology. R is also an unit less entity reported as percentage. For example, 50% recovery factor. Again,use 0.5 in your math. FVF is usually given. Also unit less. So, only time you need to worry about the unit conversion is when you calculate the volume of the reservoir. Keep all units in feet and get the STO in cubic feet. 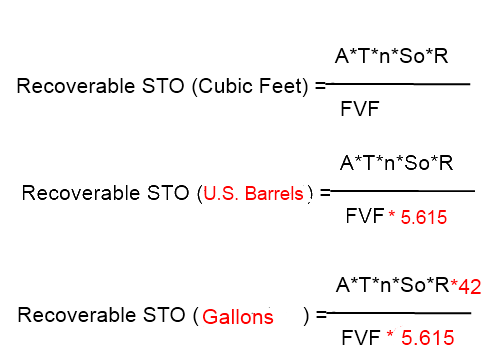 Apply conversion factors if you need STO in barrels or in gallons. 1. A sandstone aquifer near Mumbai coaltal area is 3 miles wide and 1.5 miles long. The aquifer is 300 meter thick with 32% porosity and 19% water saturation. Calculate the reserve of oil as STO in barrels if only 40% of the oil could be recovered. The formation volume factor of the reservoir is 1.2. Enjoy the problem and make sure to practice well before taking the ASBOG test.